I have written a lot about the dwarf varieties of Banksia spinulosa but virtually nothing about the dwarf forms of Banksia ericifolia, I must rectify this! They are also prolific flowerers and have a wonderful dense habit and are equally bird attracting. There are several varieties, however the one in these images is Banksia ericifolia ‘Orange Glow’, a compact form reaching approximately 1.5 metres high by 1.5 metres wide. The flowers themselves are quite large for such a small shrub growing to about 20cm in length and appear from Autumn through Winter. It makes a wonderful feature shrub when not in flower too, with its soft ferny upright branches giving contrast to other larger leaved species. Banksia ‘Orange Glow’ requires a well drained soil in full sun to part shade, it will happily grow in amongst other native species to help form a dense habitat for small birds and nectar eating marsupials. 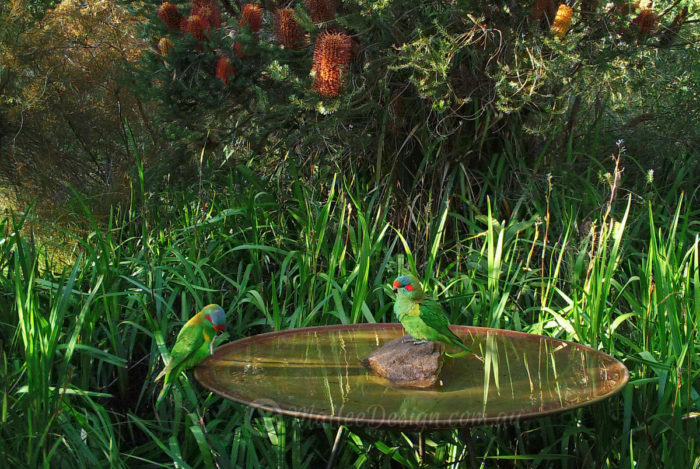 In the image above you can see it perfectly positioned next to a bird bath, where it will supply birds with a perching point to hop into the water. Other natives in the above image are Grevillea ‘Gold Fever’ in the foreground, Graptophyllum ilicifolium behind that and then a bit of good old Robyn Gordon mixed in between.